As I was writing this post last night, we received the heartbreaking news that Amy (Scarlet Chandrayaan in SL, owner of Alouette) lost her battle with cancer. It was for Amy that the Leaf on the Wind fundraiser was held (which I covered a little here), though she never was well enough to visit London. Amy and I were not close friends, but she touched my life and the lives of hundreds of others in SL, and on Plurk, with her kindness and strength, with her good humour and talent, with her grace and just being really, genuinely, truly good. I cannot pay enough tribute to her. She was an incredibly beloved young woman who was taken too soon and will be missed and remembered by everyone who knew her. A couple weeks back there was crazy mad excitement on Plurk when Redd Columbia announced she would be bringing back her store, RC Cluster, and with all the old faves remade in mesh, to boot! 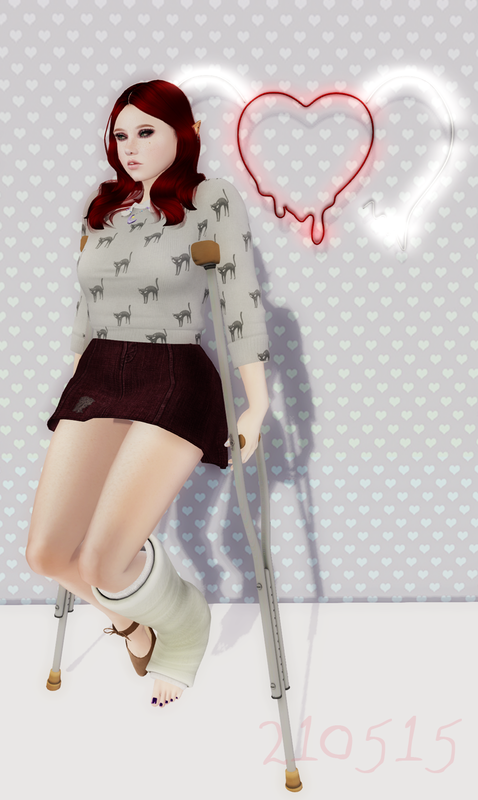 After an initial exciting Fifty Linden Friday release of some fun and delicious glue and an awesome karaoke machine, the next wave of products is out and I'm starting with the crutches and cast set! These beautifully detailed crutches have a built-in AO for all your hopping needs, which includes some rather daring moves like the swinging I'm displaying in the top picture to take the strain off your good foot, as well as some more conventional keeping-the-cast-raised sort of standing. The cast you can wear comes in a Large or Small size and is signed or unsigned - here I'm wearing the unsigned because I'm a bit of a loner. A pro-tip - Even though my cutie shoes by Ingenue are rigged mesh, and so they cover both feet, I hid the one on my cast foot by editing with Select Face checked, and set the textures only on the left foot to 100% transparency. Just remember to set it back to 0 when you're done! The crutch and cast set is fantastic for RP purposes or if you just feel like you don't hop enough. My skirt is by Sn@tch and I love the little worn scuffy patch on it, makes me feel like perhaps I was wearing it when my unspecified leg accident befell me. My sweater is part of Bubble's new Pastel Goth release at Suicide Dollz, my grey one is covered in scaredy cats, but there are all sorts of light colours with designs like crosses, spiderwebs, bats and um...bows with eyeballs. I'm wearing a parted lips alpha by Kibitz, since I have finally figured out how to wear these things without looking completely derp. At least from the front. The is the new Vampy version from the summer round of Cosmetic Fair, the shading tattoo layer really sets them apart from a lot which are just an alpha, but between that and my hairbase, freckles, eyebrows and beautiful eye makeup by La Boheme, I NEED MORE TATTOO LAYERS. Behind me, on the wall, Atooly's Neon Heart Angel is available at The Fantasy Collective and is available in 3 colours and is going straight into my house after this!